Jefferson Square is a 5.6 acre green space in the Western Addition. Bring your dog on a nice afternoon for a walk. 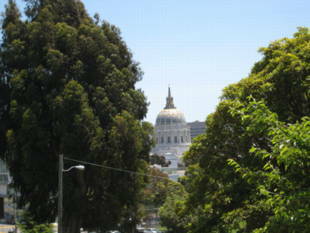 If it's hot outside, enjoy the shade under many of the big trees. The park is on a hill so you'll also be able to enjoy some views of the city, including City Hall's rotunda. 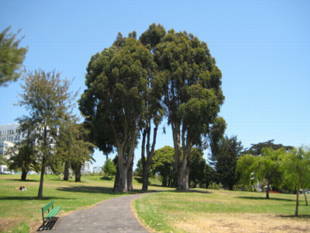 The park is next to Margaret S. Hayward Playground which has a playground as well as many sports courts and fields. There is also a rec center at Hayward Playground. Go to the "Margaret S. Hayward" page on the ParkScan website for more information. 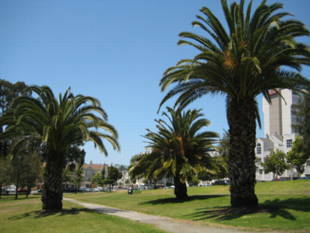 Jefferson Square is owned by the San Francisco Recreation and Park Department. #5 Fulton - McAllister and Laguna or McAllister and Gough; walk two blocks north to Turk. In the early 1900's, Jefferson Square was 11 pastoral acres of park -- hilly contours, trees and shrubs. But on April 18, 1906, earthquake and fire reduced the city to rubble and smoking ruins from the waterfront to Van Ness Avenue, and 'citizens driven from homes, moving aimlessly about, keeping in the open, camped in parks.' (San Francisco Examiner). In charge of relief efforts, the Army organized a system of refugee camps on 31 parks around the city. Giving long-term shelter to some 20,000 homeless residents, all the camps had tents; some also had wooden shacks. Jefferson had both. Families who obeyed the rules and presented a plan for rehabilitation were provided with food, clothing, tents, and aid from social workers to help them return to self-sufficient lives. Jefferson was one of the larger sites, better equipped to house its colorful, often boisterous community of 1500-2000 people. It had a tent school, an emergency hospital, clothing distribution store, soup kitchen and social hall. Its central communications board helped find and reunite families. Residents were given to mass protests denouncing, among other targets, the soup kitchen, food rations, the quality of clothing donations, bath house facilities, and United Railway vehicles. Ordered to move to the large camps in Golden Gate Park, they refused to budge. Fifteen dissidents formed the United Refugees Corporation to start cooperative farming and real estate enterprises. There were summer band concerts and, at Christmas in 1906, a nearby neighbor gave each child in the camp five dollars. In one of the suicide attempts that crept into several camps, a 70-year old Jefferson Square resident took carbolic acid and swallowed safety pins and coins. He was treated at the emergency hospital. When it was closed in October of 1907, 'Jefferson Square became a meeting place for left-wing orators,' a camp record reports. Jefferson Square's life as a park was resumed and reduced by half in 1917. 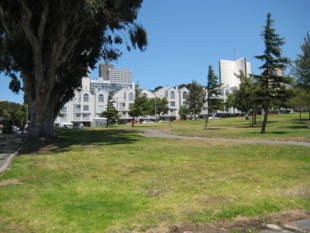 The Park Commission transferred jurisdiction over its flatter ground to the Playground Commission and the site became Margaret S. Hayward Playground. Records in 1924 describe Jefferson's now 5.6 acres as a 'noteworthy example of landscape gardening, largely used by neighborhood residents, especially women and children.' In 1946 two men shot a pigeon in the Square to make a pigeon pie. Fined $25 each, they were also deprived of their pie and their kill, which went to the city disposal squad. 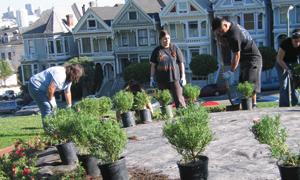 Fast forward to the Recreation and Park Department -- Park Assessments in 1998-99 and the Strategic Plan and Capital Plan that followed in early 2000. Jefferson's assessment focused on installing a lighting scheme, improving pathways, walls and benches, adding a drinking fountain, litter receptacles, signage, and renovating the plaza overlook. The price tag was $1.5 million. But the economy tanked, the city budget shrank, and downsizing was the mandate at Rec and Park. Jefferson Square was put on the waiting list. When a proposed Dog Play Area was shelved in 2003 by its $100,000 price tag, the neighborhood work team installed some low tech practical features- signs for the play area, and boxes with recycled grocery bags for waste disposal. Park representative Stuart Nachtsheim, who is also the District 6 representative for the Park and Recreation Open Space Committee (PROSAC), took over the lead two years ago when his predecessor moved away. He values the open space in his 'overtaxed neighborhood' and sees a lot of potential for the park. 'Our rudimentary, day to day needs,' he says, 'are keeping the park clean and safe and limiting overnight camping and drug use' by homeless visitors. He and his Saturday work team are looking forward to the return of the Rec and Park gardener they have been without for weeks. The main item on his priority list? 'Adequate lighting,' he says. A visitor enjoying an evening stroll around the walkways would definitely agree. Source: 'From Tents to Shacks: A Guide to San Francisco's 1906 Earthquake Camps' by Jane Crydan, San Francisco History Center, San Francisco Public Library. Please contact the group for more information.